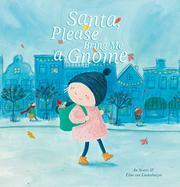 In this import first published in Belgium and the Netherlands, a little girl hopes to receive a gnome from Santa as her gift but receives a hamster instead. Tess, who looks about 3 or 4, has decided the only thing she wants for Christmas from Santa is a gnome to be her companion. She prepares a dollhouse for the gnome’s home, with tiny furniture built by her grandpa and a patchwork quilt made by her grandma. On Christmas morning the furniture and blanket have been moved into a glass box, with a note and a surprise inside from Santa: a hamster named Flannel. The note explains that Santa had planned to give a gnome named Gerard to Tess, until a needy hamster showed up at the gnome’s door. The hamster needed a good home, so Santa and his gnome thought of Tess. The little girl accepts Flannel and the change of gift, and the two become best friends. Soft-focus watercolor-and-pencil illustrations provide a pleasant accompaniment to the gentle story. Tess and her family and the gnome all have light skin. Tess adapts to the change of gift plans a little too readily to be wholly credible, and many young readers may find the perky gnome, who can dance and read and speak (at least in Tess’ mind), a more desirable companion than the nonverbal hamster.